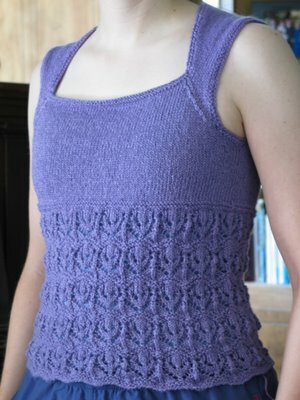 Lotus Blossom Tank KAL: New ... and done! Although I just officially joined the KAL, I finished my lotus blossom tank on Tuesday. I've been reading all your posts as I knitted and enjoyed the useful tips and great pictures! I had originally started on the smallest size in June, but after completing 3 lace repeats I tried it on to find that it was huge (my swatching had led me to use a US 6 Denise for the main needle). I wanted it to be fairly body hugging, and it was more like a tent. So, I swatched some more, frogged the whole thing, and started over on July 3rd with a bamboo US 4 for my main needle. I did 5 repeats of the lace and added an inch or so to the stockinette portion of the bodice. I made two big errors that I discovered late enough that I decided not to fix them (I'm a fairly new knitter and, apparently, not a perfectionist type!). I accidentally increased 1 stitch early on in the 7.5" of stockinette on the upper part of the back -- so I K2tog during the first shoulder shaping row when I discovered it. Also, I had never done short row shaping before and didn't know I needed to "hide" the wraps (I neglected to look in the back of the magazine -- like an idiot! ), so my left shoulder shaping is a little wonky looking. Additionally, I had to get a third ball of the bamboo yarn that was from a somewhat different looking dye lot, but I joined it at the shoulders on both sides, and it's not too annoying. I am blocking the tank now (photo is pre-blocked), and will be wearing it for real soon! Oh, yours is simply gorgeous! What color did you use? Thanks! I used the "purple" SWTC bamboo. wow! Looks great and fits you very nicely! I love the color, too! Great job, especially since you claim "beginner" knitter status! whoa, looks awesome! i'm really happy to see that it came out nicely fitted. i hope i get similar resuls. Rosann, I noticed in the comments to your "newbie" post that you had to start over with fewer stitches. Good luck with your modifications, and I would love to see more progress photos! As this experience reinforced for me: it sure is a good idea to keep reminding yourself to check the sizing as you go -- I'm definitely glad I did! That's lovely! I have no idea how you got it to lie so flat in front, mine keeps curling. It looks absolutely wonderful! Thanks, Batty. I think the fact that I ended up making it with zero to a little negative ease helped keep the neckline from curling too much (it's pulled tighter across my body). It still does have a slight tendency to curl (though it's not really noticeable in the photo). Yours looks lovely off (really cool color pooling! ), but since I haven't seen it on you, I don't know how closely yours fits. My other idea is that I may have made the whole neck area tighter than I was supposed to during the seaming (I kept having trouble with the seaming and redid it several times -- I may not have put my markers back in the correct places)? That's gorgeous!! I love the color and it really fits you well.